...and even drive growth for teams. This past year, I’ve been consulting for a company and one of its contractors on a big project. Since this project requires close coordination, a large part of my work has become helping the two teams work together. This has not always been easy – the scope of their project is massive, with matching stakes for success and failure. The deadlines are aggressive, and the stress level is consistently high. I first came across this quote in a best-selling book from the 1970’s titled “Eric.” It was about a boy diagnosed with leukemia at age 17. I read it when I myself was a teenager, and coming to realize that life was a lot tougher than it appears when you’re eight or nine. Although I didn’t fully comprehend the meaning of the quote back then, I did recognize that it touched on important values about life and our relationships. 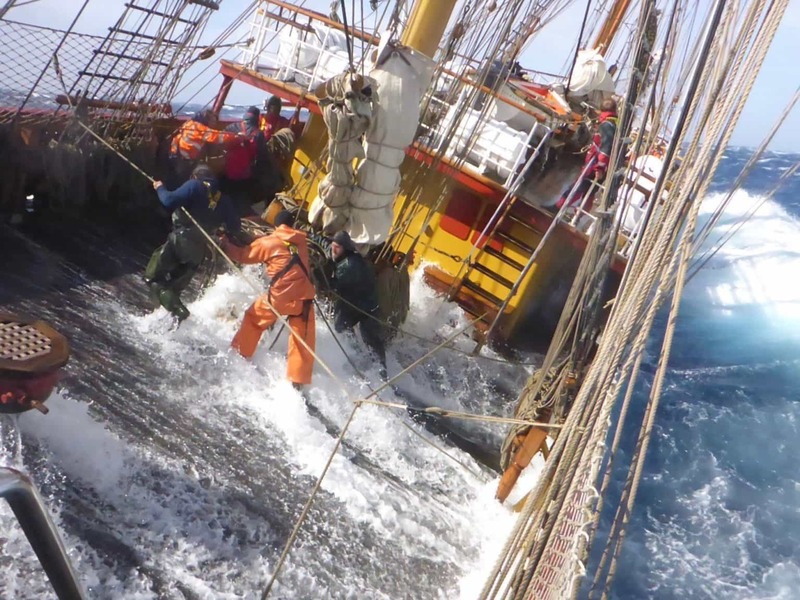 On a stormy sea: Life and work present struggles for each of us. We all face challenges that come from living a life that is neither predictable nor completely in our control. We want our life to be easy, pleasant, and logical. We expect people to behave in the same way: consistently, responsibly. And if/when they don’t we expect them to face consequences. Unfortunately, life doesn’t work that way. The seas get stormy and frequently toss us around violently. In the same boat: Our fates are joined in the struggle. If you step back and look at the human condition, we all experience similar troubles. This “boat” could be your company, a team project, or your family. If you step back far enough, our whole civilization is a boat we’re all on. In the grand scheme, there are no escape hatches built for one. If a project fails, it fails for all of the people involved, and the same goes for successes. A terrible loyalty: This phrase can sound a bit weird to our modern ear, because we think of “terrible” as negative or bad. But, in this context, it means “complete” or “inescapable.” So, because life is stormy and we’re in this boat together, we must go about life with a spirit of cooperation and kindness. If we are intent on charting a moral, successful, and compassionate course for ourselves, this loyalty is terrible as it is non-negotiable and fully binding. What’s amazing about this “terrible loyalty” is that while it pushes us towards ethical and compassionate responses to those we work with, it also draws out the best from those around us! So, whether it’s with clients, contractors, or colleagues, Rewire recommends developing four interrelated qualities in order to cultivate this type of loyalty. On this stormy sea, we need each other. Each person brings something important to the endeavor of surviving and succeeding together. Some examples include, physical strength, humor, critical thinking skills, leadership, navigational expertise, etc. Loyalty requires us to have a healthy view of ourselves. We cannot believe that we are intrinsically better than others, nor that we are any worse. We have a duty to see worth in each other and ourselves. One way to cultivate humility: Practicing metta (loving-kindness) meditation at least once a week helps to keep us reminded of the worthiness of ourselves and other people in our lives. Steve Scanlon released a video recently about Unconditional Positive Regard (UPR) — which is about letting go of our negative judgments of others as well as ourselves. When we judge others, due to our Lizard Brain’s need to be right and in control, we are not able to feel loyalty to them. Typically we get into the judgmental mindset when we are trying to divert our attention away from our own inner critic. By pointing the finger at other peoples’ faults, we are attempting to make ourselves feel better. One way to cultivate non-judgement: Whenever you begin to find yourself being critical of others, stop for a moment and explore (with kindness and gentle curiosity) what types of thoughts about yourself those judgements might speak to. Then take some time to send yourself some loving kindness. This is especially important in our workplaces, where we have ample opportunity to be annoyed or disappointed by those around us. Loyal people are grateful people – grateful for their friends, acquaintances, material blessings, and life. Gratitude and loyalty are inextricably linked because, when we are able to recognize the goodness that others offer us, our appreciation keeps us in the mindset of dedication to reciprocating the goodness. In contrast, when we stop appreciating what others do for us, it’s easy to slip into negative judgment. One way to cultivate gratitude: Keep a gratitude journal. Every night before you go to bed or after you meditate in the morning, write a quick list of three things you are grateful for. There’s nothing too small or large to make it onto the list. Try to make each entry unique for the week. Notice if any people from your work make it into that journal, and make a point to thank them next time you see them. In his deeply personal and haunting book, Man’s Search for Meaning, Viktor E. Frankl writes about the people living in the abject conditions of the Nazi’s concentration camps. “We who lived in the concentration camps can remember the men who walked through the huts comforting others, giving away their last piece of bread. They may have been few in number, but they offer sufficient proof that everything can be taken from a man but one thing: the last of the human freedoms: to choose one’s attitude in any given set of circumstances, to choose one’s own way.” The path of “terrible loyalty” to our family, our friends, and even strangers is marked out by small and large acts of selfless generosity. One way to cultivate generosity: Start exercising your giving muscle. There are all kinds of meaningful and fun ways to give to others: Drive around with a couple of single dollars, granola bars, or apples in your car and commit to giving them away every week to people in need (without judgment). Treat a friend to a meal for no good reason. Donate to a charity you believe in to celebrate your accomplishments at work. Pay for someone’s coffee in the drive-thru line behind you. Help an elderly neighbor with yard work or grocery shopping. Volunteer your expertise at a school or youth club. What I’ve witnessed is that as my clients develop these aspects of a “terrible loyalty,” the quality of their work as well as the work of their teams changes for the better. Let us know what G.K. Chesterton’s quote means to you, or if you have a favorite quote about loyalty.